Present Indian Government’s thrust on the renewable energy is a commendable development and it helps in boosting the confidence among global investors. The contribution of solar energy has a major pie in total renewable energy sources in India. 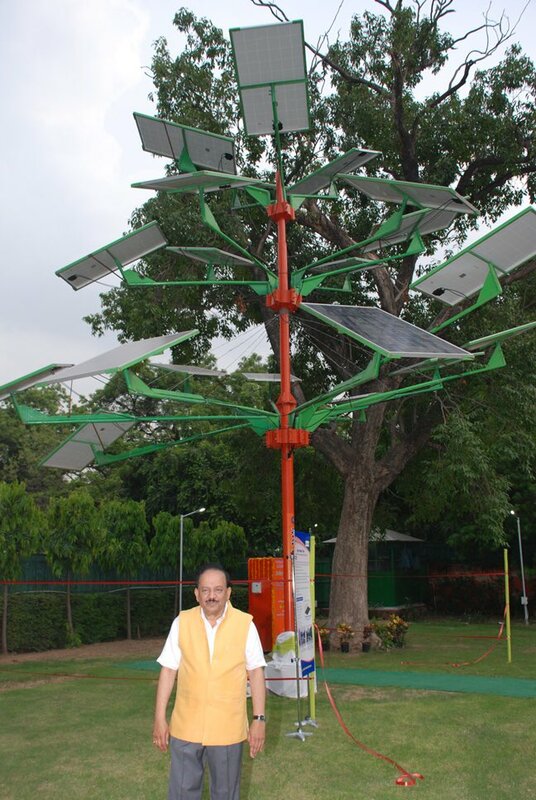 To achieve the earlier announced goal of 100 GW solar capacity by 2022 in India, Union Minister for Science and Technology and Earth Sciences Dr. Harsh Vardhan has launched the 5 kW ‘Solar Power Tree’. The innovative solar tree aims at utilizing minimum land to harness maximum solar energy. It could solve the biggest hurdle of getting a piece of land of desired size to harness green energy. A CSIR-Central Mechanical Engineering Research Institute (CSIR-CMERI), in West Bengal has designed the ‘Solar Power Tree’ enough to power about five households. “In order to produce 1 MW of solar power it requires about 3.5 acres of land in the conventional layout of solar panels. Thus, for any State in the country to survive on green energy, there will be requirement of thousands of acres of land. Acquisition of land is a major issue in itself,'' the minister said. “Solar Power Tree' takes only 4 square feet of land to get 5 KW Solar Power Tree, whereas in conventional layout it requires 400 square feet of land." Dr. Girish Sahni, DG, CSIR said. “The device has been functioning effectively at three places in West Bengal as a pilot project. As a future prospect, the Solar Power Tree would be developed in a rotatable module, which would have a motorised mechanism to align itself with the movement of the Sun during the day. Hence, it would be possible to harness 10-15 per cent more power over and above the current capacity,” Dr. Sahni added further, reports Sputnik News. A solar tree harnesses solar energy for producing electricity with an innovative vertical arrangement of solar cells. The construction of solar tree is quite simple, the solar panels arranged on a pole, in a manner that they harness maximum solar energy. It is a collection of solar panels put together angularly to absorb the maximum amount of sunlight. The solar power tree can be installed by the side of regular farmland. It could become the additional source of income for farmers. The innovation finds its viability both in rural and urban areas.